Rocks by SCIENCE WIZ / NORMAN & GLOBUS INC.
Relate rocks to the history of the planet. Uses exciting eruptive experiments to foster comprehension. Mold and slice open a model of the earth, Create a lava fountain to explore density, Spew a volcano, Make pyroclastic eruptions, Discover which rocks will float and which will burn, Identify, break & display volcanic rocks, Sediment sedimentary rocks, Acid test rocks, Explore metamorphic rocks, and Form fossils. — John Blair, owner of Science Safari in Cary, N.C., told TDmonthly in a late Summer 2012 survey that Norman & Globus products "are perennial. I continuously do well with these." EquiLogic by FAT BRAIN TOY CO.
Nine Squares + Three Rules = One Solution. This collection of 48 puzzles will enhance critical thinking, logic and deductive reasoning skills while sharpening math and sequencing. Each EquiLogic puzzle provides number, symbol, color or shape hints. Using these clues, players put their deductive reasoning skills to the test and must find the magic number by identifying the correct combination of tiles and numbers. With only three rules to follow, kids will quickly be scratching their brain to arrive at the solution. Schoenhut's miniature version of a baby grand piano is designed to encourage a child to play and develop a love of music. Elegant in appearance with graceful spindle legs, yet extremely durable and sturdy, it makes a beautiful addition to any home. Lovely chime-like tones are produced by small hammers striking metal rods, the sound that makes Schoenhut toy pianos unique. The two-and one-half-octave span of full-width keys provides a good foundation for the transition to a larger model. Includes: Schoenhut's Learning System and bench. Quoridor by Gigamic by BACKALLEY PRODUCTS, INC. The aim is to reach the other end first. The problem is that each opponent puts up fences to slow the other down. Not to worry, there's always a way out. But who will find the shortest route? Created by Gigamic; exclusively distributed through Back Alley Traders in the USA. — As of 4/10/2012 this product had 4.8 out of 5 stars from 25 reviews on Amazon.com. The possibilities are endless with the 147-piece Quadrilla Twist and Rail Set. 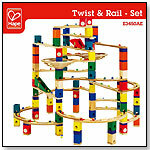 A combination of straight and curved rails and even funnels plus color-coordinated blocks offers a new level of fascination to a build and play toy. Launch date: January 2012. Awards: 2006 Oppenheim Toy Portfolio Platinum Award; 2007 TDmonthly Top Seller Award; 2007 Creative Child Preferred Choice Award. The award winning combination of a game, a brainteaser and a puzzle all rolled into one. Based upon concepts of spatial recognition and visual discrimination, the Pajaggle Board Game challenge players to quickly put unique pieces where they belong. Simple, right? Think again! Pick up a board and give it a try. What could be better than a puzzle kids can actually play with? This 28 piece puzzle only fits into the hardwood storage box one way but don’t worry, the images are painted in bright colors on the inside and outside. A great on-the-go gift since all pieces fit snuggly in its box and latch shut. Children can build skyscrapers as the roofs of all the building pop off and are stackable. An excellent developmental building toy, pieces are perfect for little fingers and big imaginations. Sevi is Europe’s’ oldest wooden toy maker – since 1831 – using only vegetable-based paints and smooth hardwood. Play Tent Magic Wood by HABA USA/HABERMAASS CORP. Discover the Building Blocks Technics - Basic Pack Vehicles by HABA USA/HABERMAASS CORP. Solid beechwood blocks still made in Germany. Perfect for little architects with the 6 building block clamps, 6 wheel clamps, 3 building block clutches, 11 building blocks. 26 pieces. The Void is puzzling to comprehend because there’s a hole right in the middle of it. Consumers can literally put their finger right through the center of the Void. The object is to solve each side, much like one would a standard Rubik’s Cube, but that’s where the similarities end. The Void has different colors, rounded edges, and requires a different solution. Launch date: February 2012. Viewing products 271—280 out of 1181 products.